Thanks Trev, and I can empathise with your wife. I was once told that I may not walk again. Now being the stubborn moo that I am, I just said “watch me”. Now, I do walk, of a fashion, however, I put myself through a vast amount of difficulty and pain to do so, and constantly pay the price. We are all guilty of judgement at times; I know I sometimes see someone parked in a disabled bay who doesn’t appear disabled, and I have to give my head a shake and remind myself that there’s probably a reason that’s not visible. There will always be abusers of the scheme, just like there are abusers of the blue badge parking bays (sitting in the car while a perfectly able bodied person goes shopping is one of the most frequently seen), but my point about dealers/salesmen is they do not have the medical knowledge to have any opinion on eligibility. My husband is a car salesman, and I know through him many of the comments and judgements made by his colleagues on ‘disabled’ persons. I won’t repeat any of them, as they can be quite insulting. We are in the 21st century, and a supposedly intelligent society, yet still there is much unawareness, when there shouldn’t be. 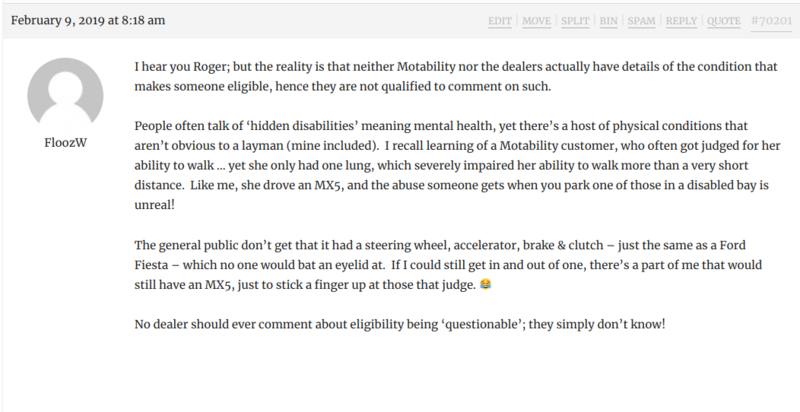 When I had my first Motability car, which was an MX5, I experienced a fair amount of verbal abuse, which shocked me – I never realised how much ‘hatred’ there could be. It’s upsetting! Certainly with my latest order, I travelling outside of my local area to a dealer as my local BMW dealer quite simply wasn’t interested! Excuse the spelling/grammatical errors that I hadn’t noticed before submitting. I regularly have that look that says”he’s not even disabled “when I park in a disabled bay even though I’m a double leg amputee though I walk well with prosthetics but I have pain and fatigue most of the time but try not to show it and i gave up parking in disabled bays after a while when I would exit my vehicle wearing a suit having came straight from work and would be frowned upon but now I think to myself I’m parking here as I’m entitled and it’s not about me having the right as I have a qualifying disability it’s more the fact it makes it easier and little do they know I’ve been on my prosthetics for most of the day therefore it’s not as easy to walk a great distance or squeeze between car doors! I used to get the look when younger, but I wasn’t on the scheme I just had a blue badge. As my incurable disabilities started in my 20’s and of course without an MRI I could look fit and healthy some days. On others I couldn’t walk at all. Ive kept going as my wife’s a physio. But ive had cars keyed in disabled bays with my badge on display. My car dented, various lectures by senior citizens. These programs on ch 5 and the daily mail have done us no favours. But ive worked since 15, ran my own business for 40 years, even now I try to work from home. So why should I be made to feel like a scrounger? my condition now means over 90 percent of my joints are fused, my lungs and heart are effected. Im bearly mobile, have a chair, crutches and a Zimmer frame by the age of 50. Im bent forward 97 degrees. So now my disability is fairly obvious. But it I never Judge others whatever the age. Until you’ve lived it you can’t understand. Nowon my first motability car and loving the feeling of pressure free motoring, at least while I can. Fortunately I’ve never had any damage done to my car, but like you I would get Tut’s and dirty looks from senior citizens when I was younger. There has always been a proportion of the population that seem to think a blue badge comes with the state pension. I have always loved to pull into a space with some really loud heavy rock music blaring out of the car at full volume, (especially the BMW Harmon Kardon system which almost makes my ears bleed) I then sit for a minute slowly get out the car, door open music still playing no blue badge displayed. The looks I get are of sheer hatred, (sometimes a small group will gather). It’s at that point I will get my crutches out and put my badge in the windscreen. It’s amazing how quickly these “disabled” pensioners can run away. I have caught myself being one of those “tutters” though. There’s a small Toyota sports car that parks in the blue badge spaces in my local supermarket. When I first saw it I was outraged, I Ithought there’s no way any disabled person could possibly get into that car. Until I saw a lady literally squeeze her mother into the car after taking her mother’s prosthetics off. Thankfully she has now got a new SUV. Such as it makes me sad to read of those that are also judged unfairly, there’s a part of me that says ‘phew, it’s not just my paranoia then’. You will never stop these ignorant people, there is an old saying ‘if you can’t say anything nice say nothing at all’. I get this all the time, I’ve had pensioners almost fall through the windscreen checking the blue badge, especially when they see the kids get out as well, as if someone who is disabled is allowed young children! Overall lighthearted reply, not to a individual post. The reassuring thing is for everylook a lessabled person has got parking in a disabled bay it means the person abusing the bays are getting the same look, I wonder if they get the look of sympathy and offers of help and asked if ok constantly whilst parking in other bays. Sometimes it’s a persons own perception of what the other is thinking and sorry it may well of been me that was staring but I wasn’t judging or even looking at you, I was thinking that cars nearly 3 years old I wonder what they are going for next or ohh so that’s what it looks like in that colour, sometimes I’m thinking lucky buggers I wish that was on Motability and lots of times it’s I’m glad I’m not parking there look at the scraps and dents on that. Lol next time you get a look guys and gals wait a few seconds you may find the person wants to ask about your Car but was put off by WTF are you looking at face looking back at them. As I think I’ve mentioned before, it’s always a treat to pull into a Disabled Bay in my husband’s Audi TT. The filthy looks we get (especially in Highcliffe, for some reason) when he hops out of the car and pops open the boot – to take out my wheelchair, put it together and then help me out of the passenger seat and into the chair for a ride along the esplanade to the cafe – much too far from the car park for me to be able to walk to/from. Never had any trouble when in my own cars, though. I think the walking stick and the weaving stagger seem to reassure them I’m for real. It’s my role in life to make a better world 😂😂 well, my dream anyway. Oscarmax, you are right, no matter how we progress with awareness, there will always be those that are ignorant. Not a reply or response to anyone. Just wanted to add, this was about twice in over 30 years. I had my car keyed by a lady pensioner who did 6 disabled bays as she couldn’t park, it was caught on cctv. She was never caught much the shame. Also I had my bonnet dented by another old gent as we had pulled into a bay and was in the process of getting my badge from my glove box. Bam bam bam with a metal handle of a walking stick denting the metal and splitting the paint, yelling at us to fcuk off! I was in an old vw touran both times. Second time I made the old boy pay through his insurance, as I somehow kept my cool and a few seconds later showed him my badge, with my photo and my two young daughters were hysterical, thinking this looney was going to hurt us. It cost £400 btw plus vat and a written apology and some flowers and teddies for my girls. Not once have I judged someone else or stopped to ask how nice the car is, I park up display my badge, get my chair or my crutches or whatever and go about my business. I am pleased to say that we have never come across the aggression or malicious damage issues that others have described when parked in disabled bays, which is a relief as we have no choice but to use them, as I need the space at the side of the car to get the wheelchair alongside in order to get my wife out of the car. In fact, we have been known to have to abort a visit to some locations when no disabled spaces are available – a problem which I suspect will occur more often with the expansion in eligibility criteria for blue badges which undoubtedly will not be accompanied by a comparative increase in the number of disabled spaces. What does concern me when I do park in disabled bays is the appalling standard of driving (and particularly manoeuvring) of many elderly drivers who may have received a blue badge due to conditions that come with old age, rather than lifelong disability. I’m afraid that my elderly father fits that category. As he has aged, his spatial awareness, speed of reaction, flexibility to turn around to judge around the vehicle etc etc have all deteriorated significantly and he can make a hash of the most simple parking manoeuvre. It makes my nerves bad when these folk arrive next to me, especially if we are in one of those poorly marked disabled bays without the full criss-cross markings between spaces. At the doctors recently an old lady arrived in the space alongside us at such speed I was amazed that she managed to stop and as she alighted I noticed that all four corners of her car were badly dented. Needless to say I was extremely relieved that we left the car park before her. I could almost hear the venom in her voice as she clearly wanted the parking spec. She just saw us in our 20’s and immediately decided we weren’t entitled to park there. Annoying but, on that ocassion at least, comical how it played out. As I think I’ve mentioned before, it’s always a treat to pull into a Disabled Bay in my husband’s Audi TT. The filthy looks we get (especially in Highcliffe, for some reason) when he hops out of the car and pops open the boot – to take out my wheelchair, put it together and then help me out of the passenger seat and into the chair for a ride along the esplanade to the cafe – much too far from the car park for me to be able to walk to/from. >:-) Never had any trouble when in my own cars, though. I think the walking stick and the weaving stagger seem to reassure them I’m for real. G.
Highcliffe is that the car park near the café, if so is that trouble maker still hand around. A few years ago we parked in the disabled bay he rode up to our car and kicked it twice, when challenged he gets his phone out and threatens to call the police, he was looking for some one to deck him so he could make a claim, the local came across and chased him away apparently he is know for it. We also get ‘the look’ sometimes when parking in disabled bays. My wife normally holds the blue badge aloft for the person to see. However, one time, we were in my plaything, a Merc SLK 350, and we parked alongside an elderly couple who were staring at us. Cue the grovelling apology from us and the large slice of humble pie eaten. It seems to me that it’s the car people have that offends. I have an Audi q3 sline and frequently get sideways looks when parking in a disabled bay. I don’t notice it too much in my wife’s megan funnily enough? I have spina bifida so when I walk away I look obviously disabled whereas sat in a car I don’t. To be honest it really doesn’t bother me. It’s the general misuse of bays that does. I’m 44 and up until 5 years ago never had a blue badge. I was brought up to tackle my disability and not expect nor accept concessions due to it. Having reached middle age though it was pointed out to me that I was avoiding doing every day things due to my lack of mobility so I caved in and applied. Wifey is wise!! On a side note I recently spent some time with family in London. Now. I really do avoid London (and in turn visiting my brother and family for the past decade) due to my perception of how busy/unfriendly it can seem. I’m amazed to say that I didn’t get a single sideways look or stare from anyone. I do here at home in Stoke regularly and not just kids!! We used public transport and everything was tailored to assist. If my brother wasn’t with me I wouldn’t have wanted to tackle this on my own but after the last trip I would be more than happy to. I came away feeling like mine and every other disabled persons difficulties had been considered and catered for. And more so that nobody looked at me as being different. Total inclusion!! The look is an odd thing and will never stop. Thats also why I don’t use public transport, I can’t stand for more then a few minutes at the most I’m fed up of keep explaining I need a disabled seat. I agree about the age thing I’ve seen some shocking parking and using bumpers as a signal when to stop. A couple of years ago my daughter got hit by a very elderly gent in i Bentley, he reversed while she waited for him in her car with her mate, out of a disabled bay in front but slightly to one side. Then crash into her front bumper. She was obviously annoyed and asked for his insurance details as he’d cracked her bumper and number plate. Her friend videod it on her phone as they are that generation who video everything. He just drove off but he was up on top of the bumper and as he drove away he pulled part of the bumper off the car. She had his registration and her friend his picture, so she called the police who caught up with him and got his details so she could get paid out. He sent her a cheque and an apology letter. We’ve had once instance of grief when parking in a Sainsburys car park disabled place. An old guy cut the corner and nearly hit our car (Seat Alhambra so big enough to see!) then jumped out of his car and started ranting that we shouldn’t be in a disabled space.The badge was on the dash but he just didn’t care. He continued ranting at me as we entered the shop, until I told him loudly and in no uncertain terms to fcuk off. He was lucky I was in a good mood. He came very close to becoming disabled himself that day. Colours I’d like to see more of in car colour options are rose gold, turquoise, teal, light green, lavender, cobalt blue, deep red, and aubergine. 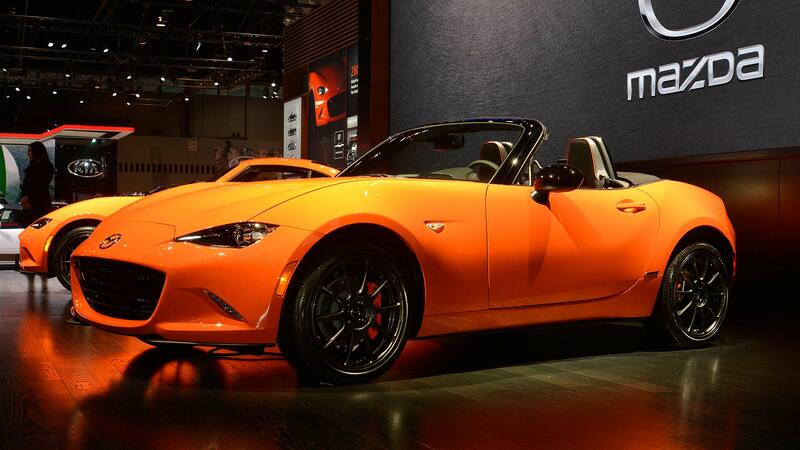 Talking of Mazda and their wonderful colours… the MX-5 is 30-years old this year. To celebrate that fact, Mazda have just launched a special edition 30th Edition MX-5 in a unique colour – Racing Orange. Very nice… especially in the RF (hard top) version. If only I could get into the bloody thing – it would be top of my wish list next changeover!! !